Is FarmVille fun? Depends on your definition of fun, probably. But the veteran creator of some big-name games is the man behind FrontierVille — the next game from FarmVille studio Zynga. And he's done stuff Farmville skeptics might like. Frontierville launched on Facebook today. It was in development for seven months under the oversight of Brian Reynolds, the 20-year game design veteran of such gamer classics as Civilization II and Alpha Centauri. He says that interactions with this new game might be "more compelling," more "interactive" than what we're used to a FarmVille. Is that code for the new game potentially being more fun? Frontierville is more than famous/notorious social game FarmVille set on the edge of American land expansion. Yes, you'll be establishing a homestead, chopping trees and building a home. But you'll also be earning a reputation (hearts!) by helping your friends who are also playing the game. You'll be able to build a family and see more than one of your characters doing stuff at the same time. You'll even have something that Reynolds calls a "living world," something designed to delight gamers of all types. "We've tried to create a sense of surprise and newness," he said. "If you go away for a while, some weeds grow and you might need to clear them out. The little trees grow into bigger trees and the bigger trees drop seeds that might grow into new trees. So there's this sense of the wilderness pushing back a little bit that it's not going to be the same way every time you come back. ... There's even little animals hiding, snakes and bears and groundhogs you may have to chase away." Reynolds doesn't want to scare the millions of satisfied FarmVille players away. He describes the new game as mass-market. 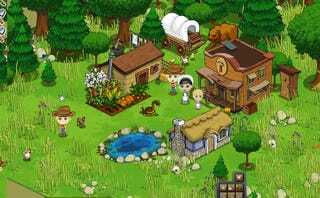 "It's not that FrontierVille is more complex [than FarmVille]," he said, "it's that maybe in plying my craft as a game designer I've been able to make the simple elements interact in kind of deeper ways. I think that's one of the ways people have fun. They're doing something simple and they discover an interesting hidden relationship they didn't know was there and can explore a little bit. There's also the fact the FrontierVille is a really open-ended game board. There's a lot of stuff to do and lot of different stuff to do. "Players like having some variety. You can chop wood for a while and then look for snakes or plant some crops or work on courting your spouse [laughs].. we kind of keep it always coming so there's always something new and interesting happening. I used some of my video game tricks so when you click on a tree to chop on it doesn't just say, 'Oh you got plus-17 wood, what happens is some logs come falling off and you click them. If you click them faster you might get a good bonus reward for good effort. We just tried to use very simple but well-known ways to make a game fun. I think people want games that aren't all that complicated because they want to be able to bring a lot of people into the game." FrontierVille might also be less annoying than FarmVille has been. New players should look for an option to send friends personalized invitations to play the game with you instead of mass-messages fire-hosed to everyone on your friends list. That tweak is an attempt by the game's developers to cut down on the nuisances that make some people block FarmVille from their Facebook news feeds. Reynolds sees FrontierVille as another step in making Facebook-style social games better. Bit by bit, he says, they will sport more advanced design — better gameplay, better tech, more interesting interactions with your friends — but they should not become so complex that they scare people off. These games are made to be played by millions, by people of all types. Maybe FrontierVille will be your wild west adventure; maybe it will be your Little House on the Prairie. And if you're a FarmVille hold-out, maybe it'll finally be your thing. To give FrontierVille a shot, head over to the game's app page on Facebook.